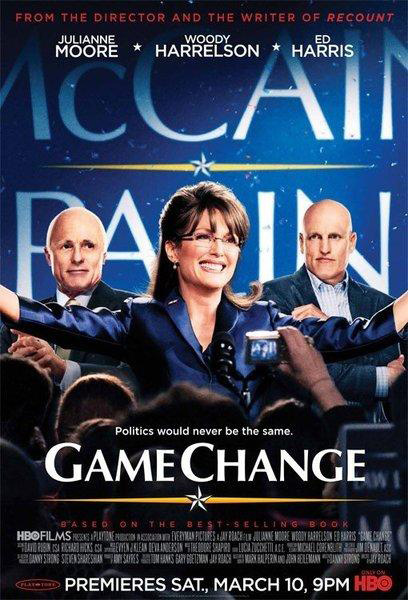 Posters of Game Change have been promising that, at the least, the HBO movie will feature excellent makeup and costume. Ed Harris gets McCain’s creepy deep brown bat eyes and does a good job, but lacks the jowls and deep anger of John McCain. Meanwhile, Julianne Moore makes a stunning transformation into one of my least favorite public figures, Sarah Palin. Beyond the up-dos, accent, and suit jackets, she is able to make the Vice President hopeful human and to my shock worthy of our sympathy. While not exactly flattering, this portrait is much fairer and less parody than I expected. Though it probably is much more enjoyable viewing if you’re one of the many that howled with sad laughter at Palin’s Katie Couric interview. Without transcending the tv movie genre, Game Change is a fascinating look at one of politics most recent dramas and reportedly was close enough to actual events to make some of the people involve squirm. Makes the rather indulgent ordering of HBO worth more than the season of Game of Thrones we got it for.